Either as part of a fundraiser for breast cancer, a girl`s birthday, a Bachelorette party. 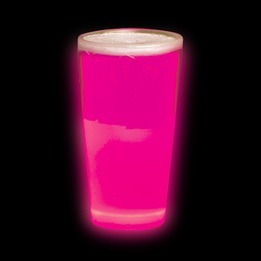 The Pink 12oz glow cup will be very suitable for your special occasion. The cup is white plastic and once activated, the color pink last more than 6 hours. You can keep the cup for later but without the glow. The glow cup has a duration of more than eight hours and is for a single use only. You must strongly press the glow cup on the edge of a rigid surface to activate the glow liquid. When you hear a small crunch you must shake the cup to disperse the glow liquid. This cup is white plastic and holds a 12 oz beverage of your choice. This 12 oz pink glow cup is not recommended for children under the age of 5 years old.